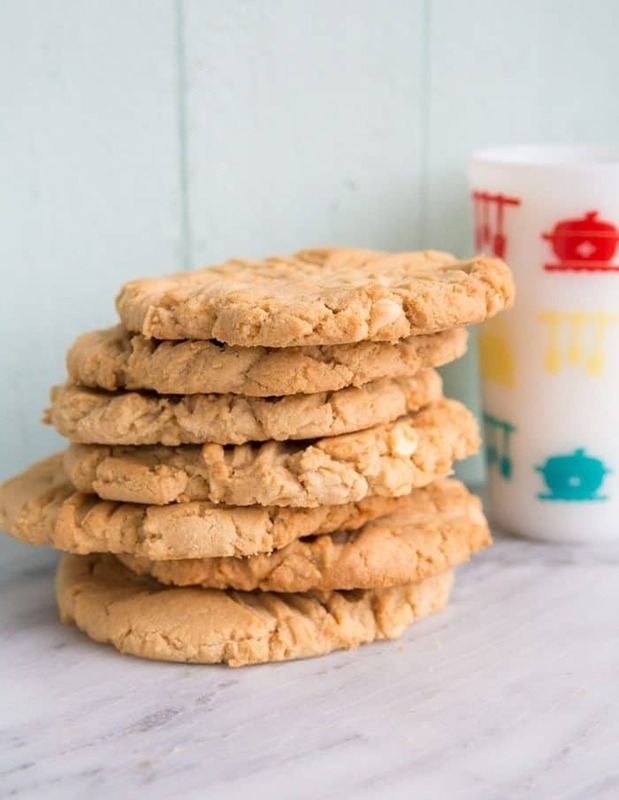 Today I have a decadent Double Peanut Butter & White Chocolate Chunk Cookies recipe for you! 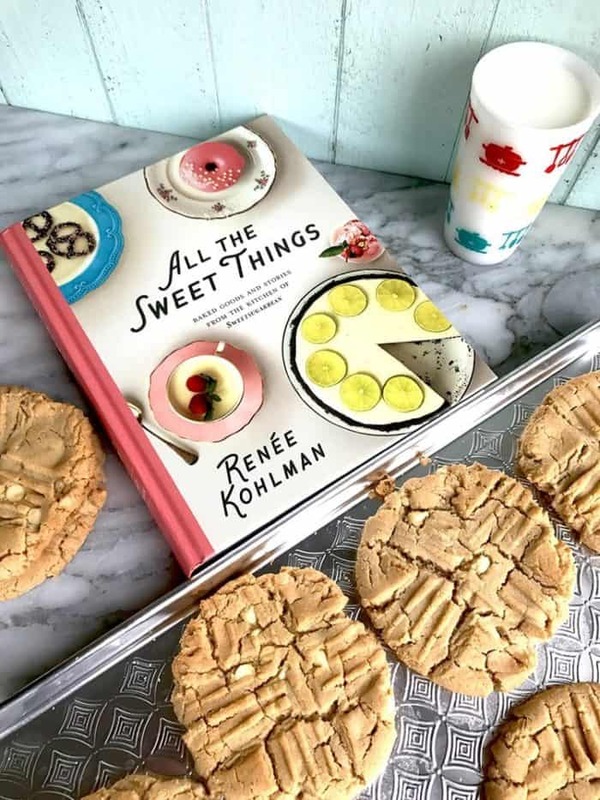 I have been SO excited to finally get a peek at a delicious new cookbook from fellow food blogger Renée Kolhman called All the Sweet Things! I met Renée on my own book tour when she hosted me at the Saskatoon McNally Robinson bookstore and was so thrilled to find out that she too, was publishing a book. I am always so excited when not only another food blogger friend publishes a cookbook, but a fellow Canadian food blogger to boot. We are out there, we just aren’t as common as our US counterparts. Yet! 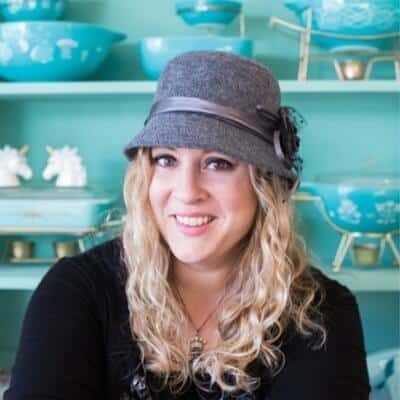 Renée is the creative mind behind the blog Sweet Sugar Bean <—— click on that link to check her out! And the book is officially here! It’s here and not only is it a beautiful book, it’s also a cookbook that is full of a million and one recipes that I want to try. Oh fine, you caught me, as that might be a slight exaggeration as the cookbook has over 100 recipes for you to try, but as I was leafing through it the first time, I saw about 10 recipes that I knew I was going to be baking up in my own kitchen. The photography is beautiful and I could hardly believe it when I read that she used her IPhone to shoot the photos! The real joy of the All the Sweet Things cookbook however, is Renée’s stories. I have been pretty vocal over the years about how I have no interest and yes, even become bored by cookbooks that have no stories within them. In an era that has a plethora of cookbooks at our literal fingertips with a click of a mouse, I insist that I spend my hard earned money only on cookbooks that weave tales between chapters and entertain me on a level that goes past good recipes. I love to sit curled up with a cup of tea in the evening and read a cookbook, the operative word there being “read”. 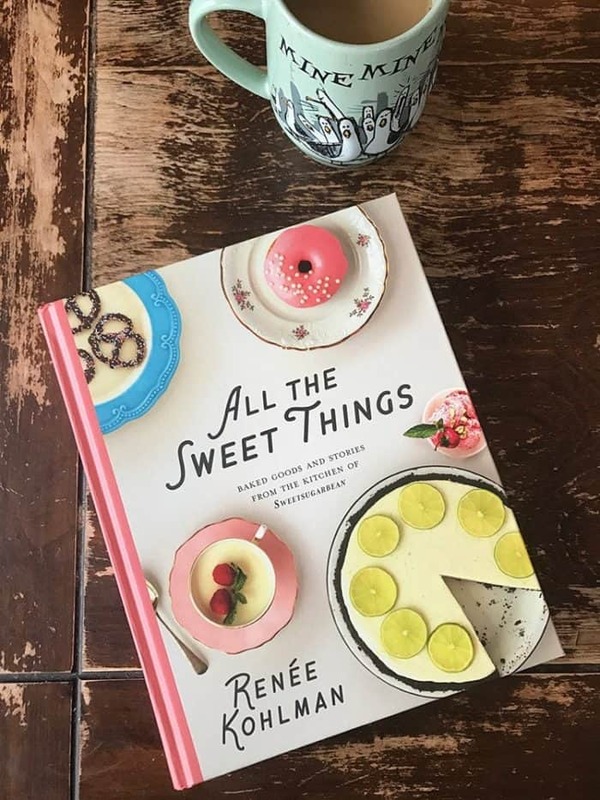 All The Sweet Things stands out for it’s absolutely fabulous stories between chapters, from Renée’s adventures in the North to her stories of Small Town Saturday nights. 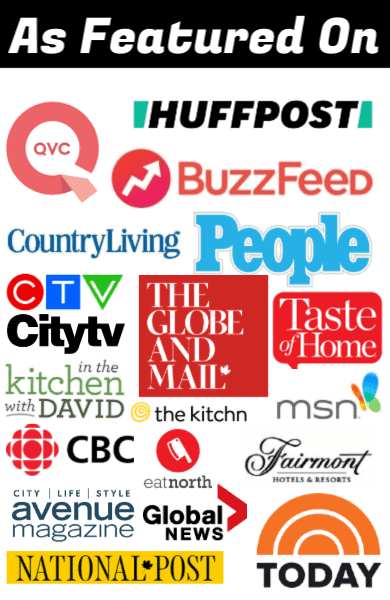 You won’t lack for entertaining reading material between choosing which recipes you are going to make first. I was torn which recipe to feature for you guys, but a new peanut butter chocolate chip cookie will always win out in the end. I’m a peanut butter cookie fanatic! Now, I left the salt off because my picky kids don’t like salt on cookies. HOW ARE THEY EVEN RELATED TO ME? That’s the amazing thing about this recipe, is that it’s very adaptable. Use chunky or smooth peanut butter, put the salt on or off make them giant or normal. Ahem. I bet Renée is going to take one look at the giant cookies I made and be like, uhhhh, Karlynn, the recipe makes 30, not 10. Not in my house! Hahah! 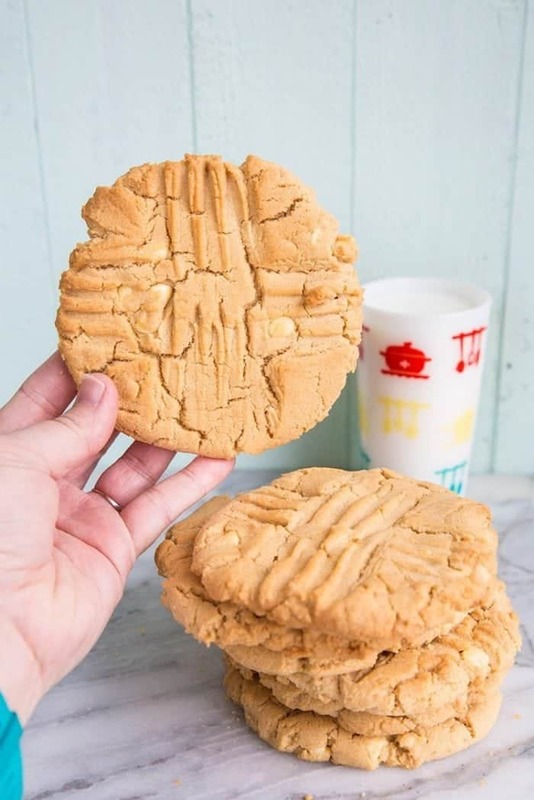 I wanted to make the kids some giant peanut butter cookies for an amazing after school treat. Again, that only shows how adaptable this recipe is. These cookies baked up like a BOSS even though they were supersize. I’m sure this is a good indication of how amazing the rest of the recipes in All The Sweet Things will work out. Without further adieu, Renée’s Double Peanut Butter & White Chocolate Chunk Cookies! Don’t forget to scroll past the recipe and enter the giveaway at the bottom of the post! 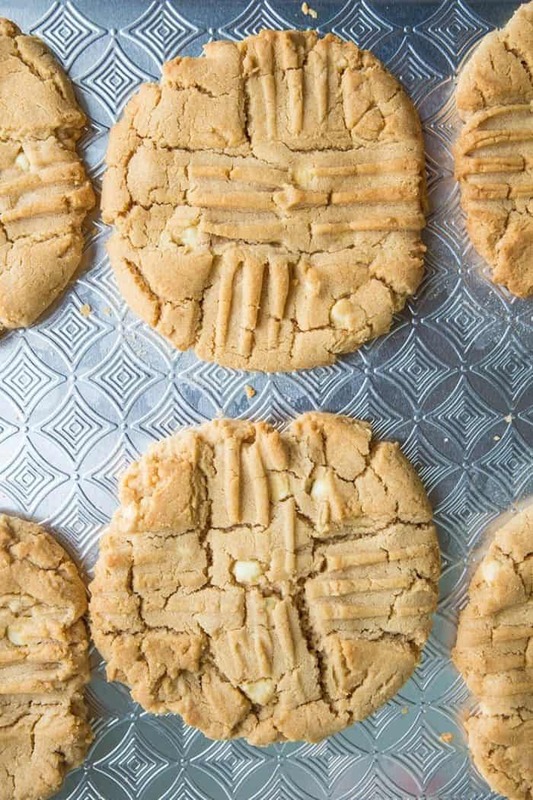 Double Peanut Butter and White Chocolate Chunk Cookies From All the Sweet Things Cookbook! Do you love peanut butter? 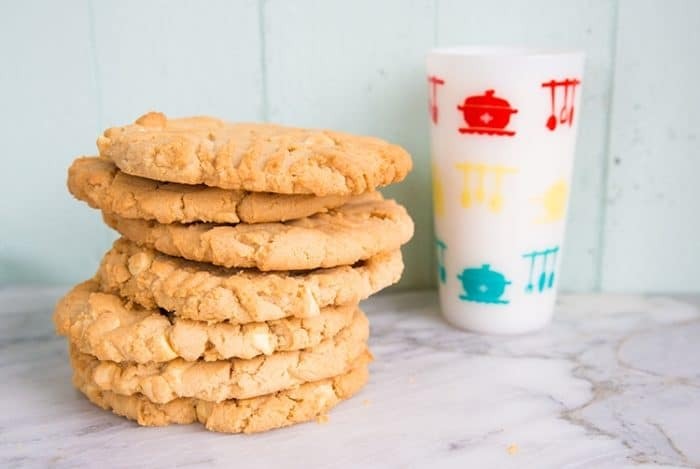 Then you will love these double peanut butter and white chocolate chunk cookies! In a stand mixer fitted with a paddle attachment, cream the butter with the peanut butter and both sugars. Beath on high speed for 2 minutes, scraping down the sides of the bowl once or twice. Add the eggs, milk and vanilla and beat on high for another 2 minutes, until light and fluffy, scraping the sides and bottom of the bowl once or twice again. Place the flour, baking soda, baking powder and salt in a medium bowl. Stir well. Add this to the butter mixture and mix on low speed just until combined, scraping the sides and the bottom the bowl. Stir in the white chocolate and peanuts by hand, just until the dough is smooth and incorporated. Cover the bowl with plastic wrap and chill for 30 minutes. Preheat the oven to 350 °F. Place the rack in the centre of the oven. Line 2 baking sheets with parchment paper. Use an ice cream scoop ( mine is about 1/4 cup in volume) to portion out the cookies. Place them about 3 inches apart on the prepared baking sheets. Flatten the cookies with your hand, so they are about 1/2 inch high. Use a fork to lightly make a cross-hatch pattern on top of the cookies. Sprinkle with flaky sea salt. Bake 1 baking sheet at a time for 8-10 minutes, until the middle is set and the edges are lightly browned. Remove the pan from the oven and let the cookies cool completely on the pan on a wire rack. Keep the cookies in airtight container on the counter for up to 2 days, or freezer for up to one month. Found you on another blog,and although,being the total blog stalker,recipe hoarder,that I am.I MUST subscribe to your blog via email,if you do that.I am a devoted and addicted foodie!In a good way??? ?.2 years ago found the pleasure of FREE recipes!Then Pinterest,17 months ago(11,100+)followers.Not bragging,yes I am,lol.Am an almost 56 years young SAHM.Loosely stated,as only 1 human left at home.Rest of gang is hairy and four legged!Anyway,you have scraps of paper with recipes on,I have BOXES of recipes (only 2 years worth,LMAO!Plus a CLOSET full of cookbooks!Why do I NOT have a blog?Lazy and tech impaired,along with horrible ADHD!Thanks a bunch! My favorite sweet thing is homemade peanut butter cups. Sweet and salty always the best combination. And for a favourite sweet, has to be caramel popcorn, nuts or no nuts a sweet treat that is hard to resist. Ooohh I would love this so much! My favorite sweet thing is any kind of pie! Baking is what I do best! I love this cookie recipe and I love to bake. I love Renee! She is the sweetest thing, along with her recipe for a Dutch baby! I can’t wait to get my hands on her new book. Until then, these peanut butter cookies will have to satisfy me. Having cookies at our wedding reception, (May 27, 2017) and going to add this to the list of recipes. Oh my! This is a winner of a recipe indeed! I hope I can win a copy of Renée’s cookbook! Peanut butter and white chocolate? These are going to made this weekend! I don’t have a big sweet tooth but when I want a treat, I love oatmeal scotchie cookies. Crunchy oats sweet butterscotch chips and a hint of cinnamon. What more could you want with a cold glass of milk? You have made these cookies the perfect size for snacking. They look delicious! Looks like an awesome cookbook. My grandmothers chocolate chip cookies! Cookies are my favourite sweet treat – all kinds of cookies! Please don’t make me pick. What is YOUR favourite? I love a great homemade cookie! I am a salty and sweet fan- so PB cookies are always a win-win! Peanut butter cookies, of course!! My mouth is watering just reading about this book. Can’t wait to check it out in person! Love PB cookies they look Devine ? Theee look amazing! I agree with you Karlynn, peanut butter always win with my too! ? I love all sweets but my favourite is creme brûlée! Can never say no! My favourite sweet thing would have to be buttertarts! 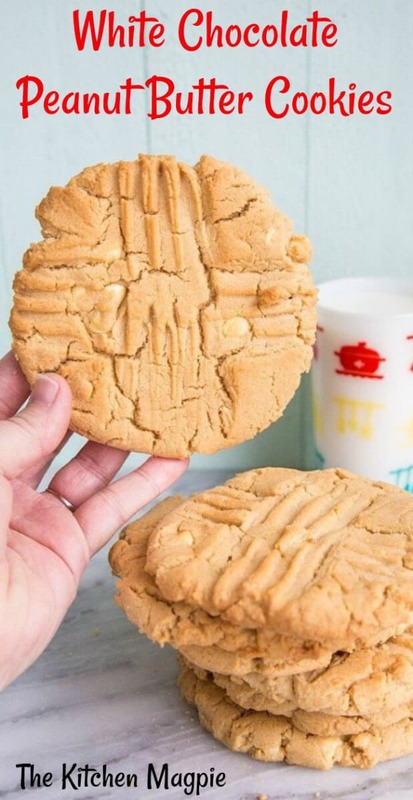 I love peanut butter and these cookies sound amazing! Will definitely have to try this recipe! Looks like a good way to use my my son’s white chocolate Easter bunny! And my favorite sweet to make are cakes! I’m always looking for an excuse to make one. I have a bit too many favorite sweet things. Cookies are a top in the category and those ones look fantastic! !